Google’s up to its old tricks again, extending software tentacles in new directions to capture or subvert entire markets: This time it’s aiming at business software by launching Google Apps Marketplace, which does clever cloud-connecting stuff. 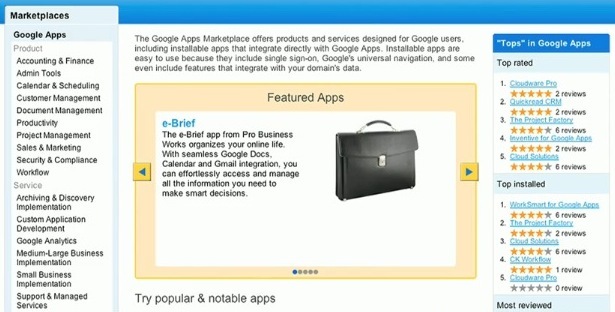 Digging through Google’s slightly obfuscating explanation in its blog post on the news, it seems that the App Marketplace has been conceived to make it super-easy for “Google Apps administrators” to find, enable, and distribute to their users all of the apps sitting in Google’s cloud storefront. The word “efficiency” is used in there too, since Google’s trying to point out that by having all of this stuff in one place, user’s “daily workflows” in Gmail, Calendar, Contacts are streamlined, and the system lets everybody share data between the apps and each other for collaborative working. There’s the usual Google emphasis on open standards, meaning it’s easy for app developers to quickly build hooks for your data into and out of other apps. And there’s mention of the Google Apps userbase of some 25 million people, to tantalize and tempt developers to write more apps. But what, when you get right down to it, is this all really about? It’s actually quite subtle: Google’s positioning itself as the conduit between Apps and small businesses, as well as being a workflow facilitator. In other words, a business may conduct its calendar planning or document creation using Google’s standard tools–and if the business then needs a project management tool, it can access one via Google’s market place and then hook it up to Google’s core productivity software offerings, in one neat integrated swoop. By doing this Google makes itself invaluable to a business, since it can basically offer almost any business management/creation tool that a company may need (assuming developers write an app for the task,) as well as placing it in the cloud for easy back-up and go-anywhere access. And we know that that’s where Google likes to be–nestling right at the core of an operation, monitoring all the to-ings and fro-ings its users get up to, so it can then sell them highly targeted ads or new services. To hear more news like this follow me on Twitter…which is a non-Google offering. For the moment.